I didn't know about this fun factoid: On April, 1970, the Grumman Aerospace Corporation—manufacturers of the Lunar Module—sent a $312,421.24 bill to North American Rockwell—who made the service module that malfunctioned in the Apollo 13 mission—for towing services. Why, you ask? Here's the story. 56 hours into the mission, at about 03:06 UT on 14 April 1970 (10:06 PM, April 13 EST), the power fans were turned on within the tank for the third "cryo-stir" of the mission, a procedure to stir the oxygen slush inside the tank which would tend to stratify. The exposed fan wires shorted and the teflon insulation caught fire in the pure oygen environment. This fire rapidly heated and increased the pressure of the oxygen inside the tank, and may have spread along the wires to the electrical conduit in the side of the tank, which weakened and ruptured under the pressure, causing the no. 2 oxygen tank to explode. This damaged the no. 1 tank and parts of the interior of the service module and blew off the bay no. 4 cover. It was the beginning of NASA's finest hour—a tale of success against all odds. At the time, Apollo 13 was 205,000 miles (330,000 kilometers) from Earth. It was not possible to turn around on a dime and get back to base. Mission control decided that the only course of action was to let the laws of physics do their magic and send them around the Moon, using its gravity as a sling shot that would put them back en route to our planet. The only problem is that the Command Module—the main spacecraft—didn't have the necessary resources to complete that trip: The astronauts had to shut down all systems in the command and service modules or risk further damage and, possibly, another major malfunction that may have killed them. Furthermore—in the very remote case that they could complete the trip back to Earth—they needed to save battery power for re-entry. And here is where Grumman's billing starts: The astronauts had to move to their Lunar Module, a ship that wasn't designed for interplanetary space travel or to support more than two people. It was the only option. The engineers at mission control and the astronauts had to do a lot of things to make it work. One example: While they had enough oxygen to return, the CO2 filters in the Lunar Module weren't designed to support three people for that amount of time. Ground control had to come up with a hack to adapt a cubic CO2 filter into a cylindrical hole, which bought them the time they needed. Another hack was to transfer the energy from the Lunar Module to the command module, which is also shown as a line in the invoice below. But perhaps the biggest feat was the manual course corrections. For that they had to fire up the lunar module's engine while using Earth as a guide for navigation. Not even Grumman's engineers were confident that these operations were going to work. The lunar module's Descent Propulsion System was only designed to be fired once, to land on the Moon. Multiples burns seemed crazy—but it worked. The invoice was drawn up, tongue in cheek, by a Grumman consultant pilot, Sam Greenberg, on Wednesday evening. [...] North American Rockwell, on receiving the invoice, had its Houston auditor examine it. Then the public relations director of its Downey, Calif. space division, Earl Blount, with a poker face issued a statement. 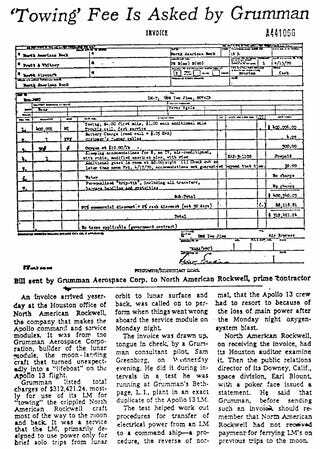 He said that Grumman, before sending such an invoice, should remember that North American Rockwell had not received payment for ferrying [Lunar Modules] on previous trips to the moon. It is great to see they all laughed about it after the three astronauts were safe at home but I shiver at the thought of what a close call this all was.